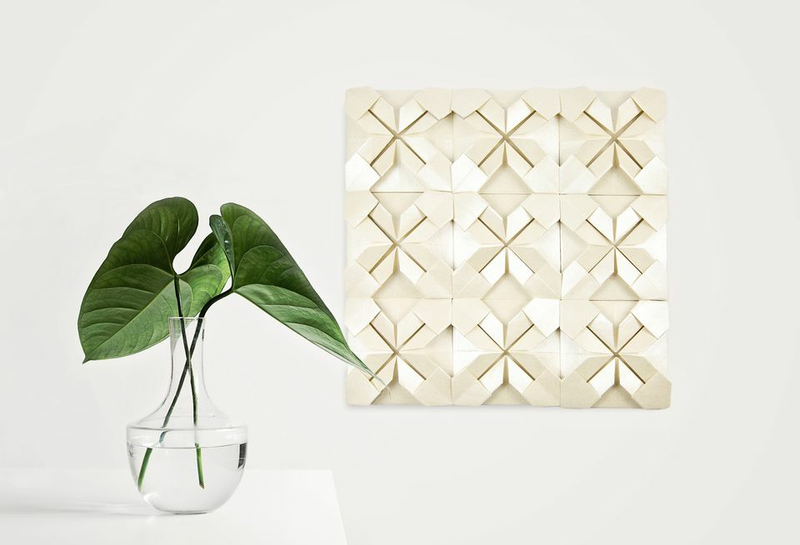 Did you know you can easily create some very stylish wall art using origami? Make large wall displays or small coasters with these easy to make origami squares. These pretty origami squares are very quick and simple to make, using only one sheet of square paper. Placing them next to each other in rows of three or more creates a very aesthetically pleasing pattern. Use a single solid color for each square or use lots of different colors for a very fun and uplifting piece. You can also create color gradients, for example, use three sheets of red, three sheets of orange and three sheets of yellow. The larger your paper, the larger your display will be. To make quite large wall displays, try to find some paper that's 30cm x 30cm. You may decide to use a bit of glue to prevent the flaps from unfolding, but it's not required. You can display the squares directly onto walls with glue-tac or mount them into frames. Flattening them behind glass is also an option and would prevent dust from settling inside the paper. Start off by folding your paper in half, from top to bottom and from left to right. This creates four equal sections. Next, fold the left and right edges in to meet the central crease, fold well. Now fold the top and bottom edges to the central crease. Unfold again. Fold all four corners to the very center. Make these creases as neat as you can. You may also want to use a bone folder to make your creases sharper. Fold all four of the points out from the center as shown. Open out the sides and flip the paper back over to the other side. Bring all four diagonal edges towards the front. All of the creases have already been created–you are simply flattening them together. Once all of the sides are collapsed, make sure to straighten out the creases. Next , we need to fold the flaps behind. We will begin on the bottom right section, folding one of the flaps over. Fold the corner of the flap back to the diagonal crease, and then flip the flap back over to its original position. Do this same process to all of the flaps, using a bone folder or use the side of your fingernail to finalize the creases. You can make as many of these little squares as you like, placing them next to each other to create very large pieces of artwork or make some small placemats using only four of them. Here is an example of how to display your origami wall art once it's finished. Using larger sheets of square paper to start with will be quicker to obtain this size, and give the art a bold and minimalist look. Alternatively, if you have more time and patience, using smaller sheets of square paper, and using lots of them, will result in a very intricate and luxurious look.